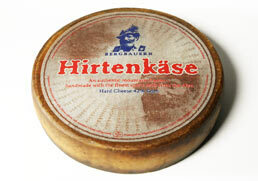 Hirtenkäse, or "herder's cheese", is an authentic mountain cheese with a rugged, earthy aroma made in the Allgäu Region of Southern Germany. 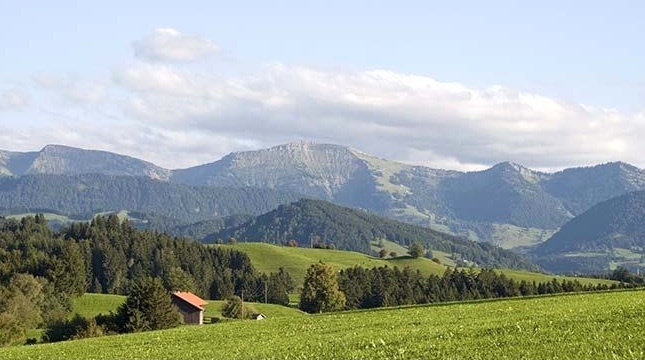 The rich cow's milk for Hirtenkäse comes from mountain farmers whose cows graze at elevations of at least 2600 feet. The farmers have only 12 to 15 cows per farm, so they are well cared for, resulting in a wonderfully creamy, rich milk. 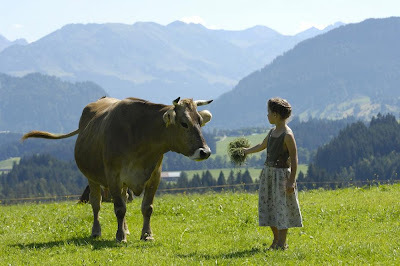 The cows enjoy fragrant grasses on alpine meadows in the summer and spend the winters in cozy barns, eating aromatic hay. 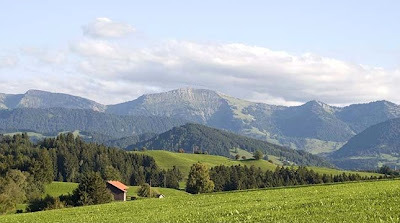 In mid September, they have a big festival in the Allgäu, the "Viehscheid", where the lead cow is decorated with flowers and the herd is led down from the mountains to their winter barns. This cheese is golden and buttery yellow in color. Its texture and taste are "rustic, savory and firm textured... with an earthy aroma, that resembles a cross between Parmigiano-Reggiano and aged Gouda. Having a firm golden interior and aromas of butterscotch and orange peel. ... even at eight months, the cheese has developed some of the crunchy protein crystals found in Parmigiano-Reggiano. Additional aging makes the cheese creamier, not harder and dryer. The flavor is concentrated, with the cooked-milk sweetness of a caramel. Pair with a slightly sweet wine, such as an oloroso sherry or a Madeira, or an aromatic gewürztraminer. Wonderful with German whole grain breads, coarsely grated over roasted potatoes, or with fresh and dried fruits, like apples and figs.